This is just a smattering of some of the great pointers handed out by the speakers this weekend – you could fill a book with them. If you’re interested in social media, or podcasting in particular, and didn’t make it out to the conference this year, I strongly recommend you try to make it next year. Thanks to Bob and Mark for putting on such a great event, and to Tommy and Francis for being such great hosts, too. Excellent post, Dave. Thank you for this “best ofs” list, from someone who could not be there, but really wanted to be there. All the inspiration, none of the travel! Well, probably not all of the inspiration, really, but some great chewy ideas here. Thanks again. Nicely captured and organized, Dave. I’m not sure, though, how you were able to limit yourself to so few. Thanks for being part of the event! @Drew – sorry you couldn’t make it. Maybe next time! @Mark – that’s simple – I was so busy listening to some of the sessions that I didn’t write down any quotes! Hey Dave, thanks for the snippets. Now I’m regretting not hopping on the 401 and heading to Kingston… But I had to work at my 2nd job anyhow. So much for having a weekend! It was great to finally have a chance to chat a bit – glad you enjoyed the weekend! You PABsters were great at capturing the content and mood of the weekend for those of us that couldn’t go. Thanks for that! Looking forward to rest that will no doubt pour in over the next few days! 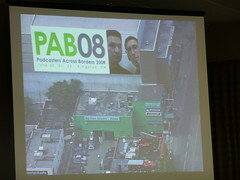 Dave, thanks for including my “podcasting” tip. I can’t believe I was able to provide something meaningful, while not even being able to attend PAB this year. I’ll be there next year, watch out! Nice job pulling the “take-aways” from the presentations. Great talking with you Dave. ps- i started running again, as of last night.